World-renowned coach David MacPherson, coach of the No. 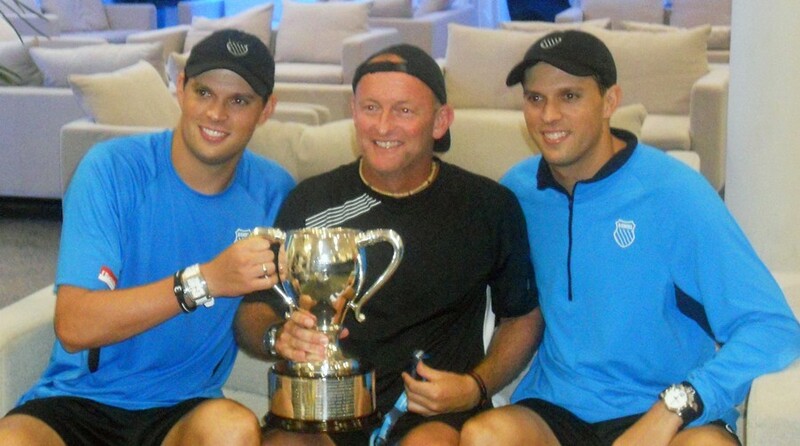 1 ranked Bryan Brothers doubles tandem) will be holding a special doubles clinic at Phoenix Tennis Center on July 16. USTA members will receive a discount off the price. MacPherson (center after Bryan Brothers Australian Open 2011 win) was known primarily as a doubles specialist on the ATP Tour in his playing days, winning 16 tour ATP doubles titles. He has also been a coach of the World TeamTennis Sacramento Capitals and Kansas City Explorers franchises. He will be appearing at the Phoenix Tennis Center this Monday from 6-8 p.m. The cost to attend the clinic is $75 per person, although any current USTA members will receive a discount to a $50 price. Spots for the cliinic will be given out on a first-come, first-to-register basis. To reserve your spot, please contact Chris Aguilar at (602) 348-2341.